You are viewing the archive for the ‘Lobster Rolls’ tag. 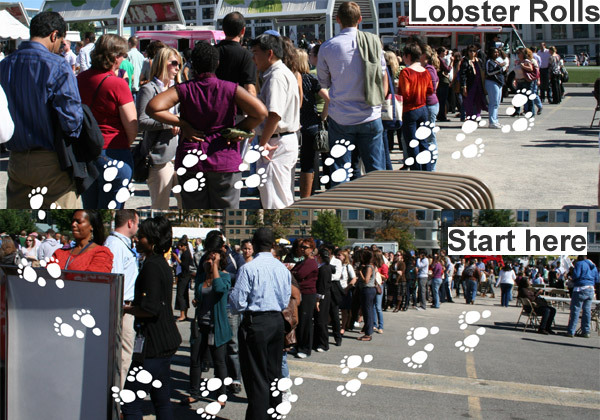 One hour (or more) long line for a lobster roll! I refuse to stay such a long line to get my lunch on a work day – who has time? At the same time, I was somewhat intrigued by the lobster rolls that made people to stay out in muggy DC weather for an hour to eat $15-18 lunch. Before these reviews of lobster rolls, I have to disclaim that I am not an expert on lobsters or grew up eating them on a weekly basis. I know good food and believe that ocean already made lobsters so tasty – all we need to do is heat it to perfection without too much of bells and whistles. Why lobsters are sustainable and expensive? Lobsters are trapped live in a cage that allows it to enter but makes it difficult to exit. This inefficient way of fishing lobster has inadvertently resulted it in being overfished. Additionally lobster sustainability in the United States has increased because lobstermen are required to measure lobster size and release small young and big fully grown lobster back to the sea to insure healthy future breeding stock. 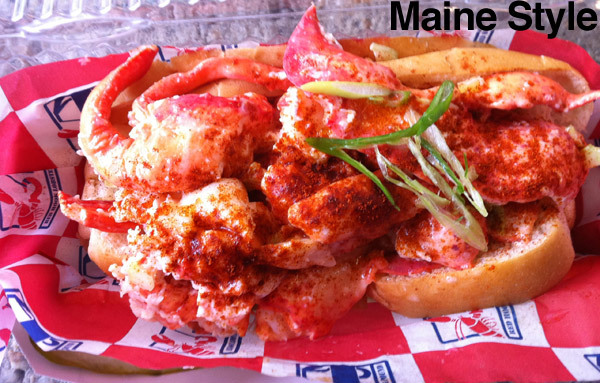 You can get lobster roll in Maine style (mayonnaise, lime) or in Connecticut style (melted butter) made from Maine lobsters. Both of them are served on white bread toast with big chunk of lobster meat and paprika seasonings. 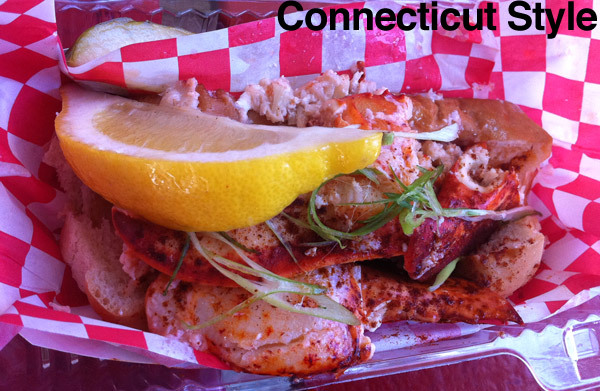 The bun sort of gets soggy with the drizzled melted butter in Connecticut style lobster roll. I would definitely recommend it if the truck is in your neighborhood and if there is no big line. I don’t think this (or any food) is worth hour-long line. Surprisingly this burger joint serves amazing lobster rolls made from lump claw and knuckle meat from Maine lobsters. I liked the fact that there was no sauce in the lobster roll. Big chucks of lobster were served on a lettuce leaf placed over three conjoined slider buns with sweet cole-slaw dressing sauce. 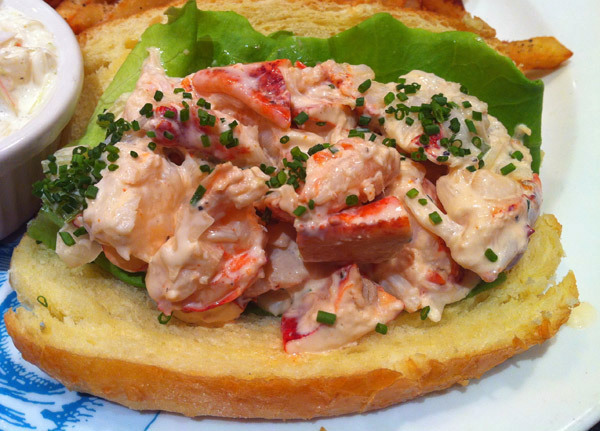 The bread base for the roll can be improved but simply the lobster and sauce makes this lobster roll worth the try. These are seasonal items and served from June to September depending on the quality of the lobsters. Lobster roll lobster from father Jeff’s sustainable Maine seafood company making it a true sea floor to your plate choice. 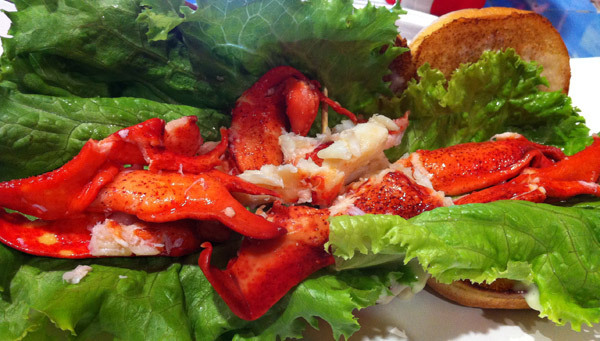 Chunks of lobster meat are made to order and served with mayo and their secret seasoning on toasted/buttered white bread bun. The butter, mayo and seasoning are all optional if you don’t like them. PS. Checkout this stop-motion animation of Luke’s Lobster Roll. 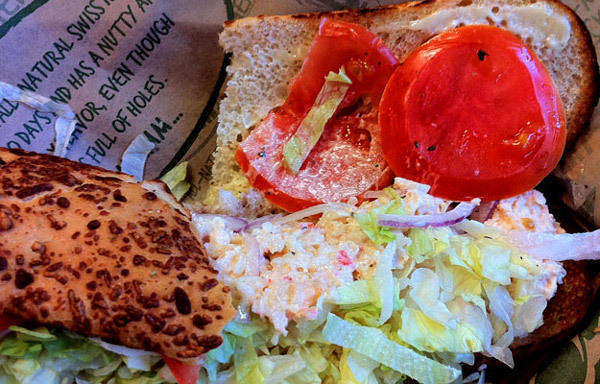 All above three lobster rolls are equally good it their own right. 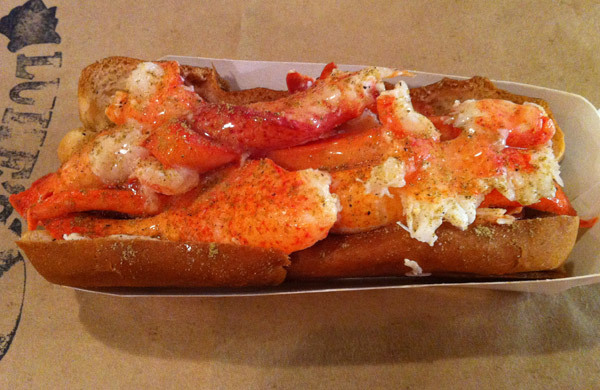 Now, here are some other lobster rolls that I would be hesitant to recommend. For comparison sake, I tried a high end Kinkead’s lobster roll. The lobster roll was not better than any other fast food place. 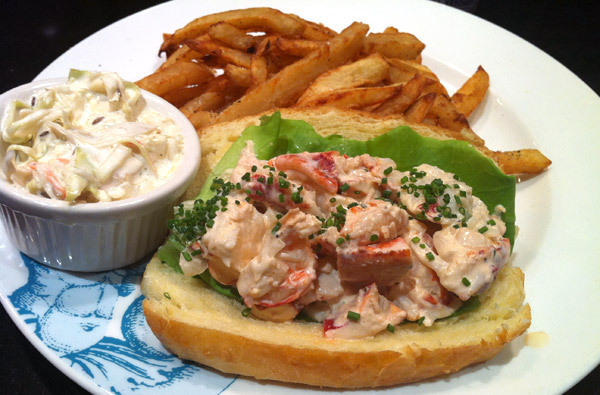 Kinkead’s Maine lobster roll is served with side of coleslaw and homemade French fries. Lobster had bit more mayo than I preferred but loved the fresh aromatic herbs on the lobster. The sides were excellent and lobsters were decent but I would not recommend paying twice for a similar quality lobster roll. 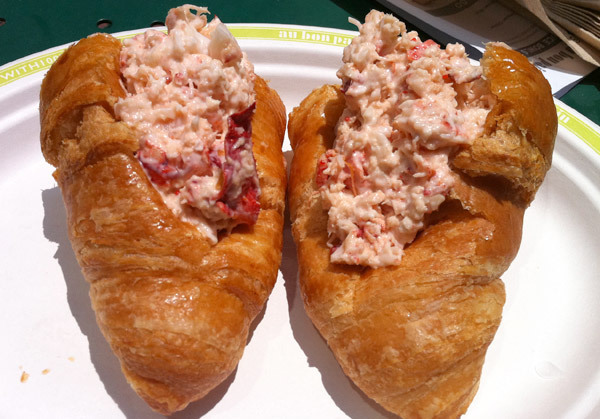 Lobster salad croissant sandwich is made from over a quarter pound of lobster mixed with light mayonnaise. I found this lobster had fewer chunkier pieces and way too much mayo (see photo). I ate it is twice so it’s not that bad but I would choose Red Hook, BGR or Luke’s lobster any day. Quiznos’ limited time lobster & seafood salad sub looked pretty on the promo but was nothing special than any other fast food sub they serve. These lobster rolls are seasonal and like Au bon pain’s choose them only as the last lobster resort. The narrator ends the video by saying, “We couldn’t help but wonder if what we’d done was just a big contradiction. It’s not their fault, they taste so good.” Indeed!